Easy to customize and make it your own! Change most colors or the wording. You can even mix the front and back of two invitations. And, our design team handles it all for you! Check out our DESIGN OPTIONS. Caring personal service. We're here to help! We're unlike anyone else. We have a short, simple order form and are just a phone call away if you need extra help placing an order, helpful suggestions or advice. Special offers, including FREE full color return address printing! No one can match our specials! We'll print your return address in full color for no extra charge. Plus a free premium paper upgrade! View all of our SPECIAL OFFERS or PRICES. READY TO BEGIN? IT'S EASY TO PLACE YOUR ORDER! Our new Photo Invitation adds your supplied photo to our stunning invitation design*. A one time $45 setup fee applies to this invitation. * From your digital file. Photos which include a copyright symbol require a release from the photographer. Make your event extra special! Click to browse our selection of party decor, including menus, dance floor graphics, photo boards and more! All matched to your invitation design for a wonderful, coordinated look. Copyright EventPrints. Reproduction in any manner is prohibited. Site design by Presentech. 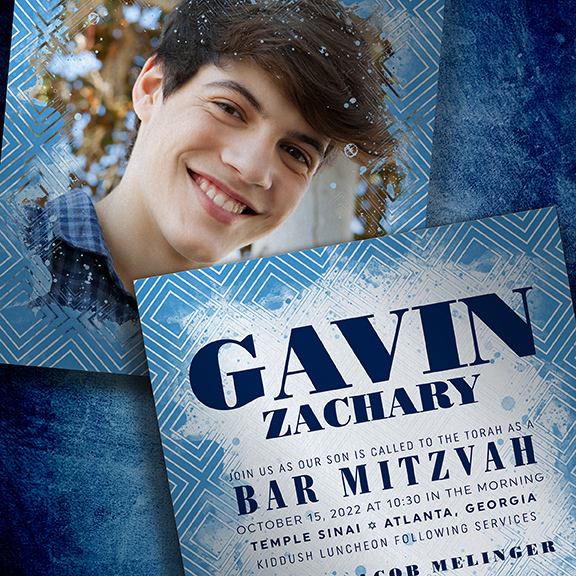 EventPrints offers modern, designer crafted Bar Mitzvah Invitations, Bat Mitzvah Invitations, Wedding Invitations and Event Decor.